A teacher rebellion flooded the streets of Los Angeles, beginning on Monday as 30,000 members of United Teachers Los Angeles (UTLA) began their strike for the schools all students deserve. As we’re reported previously, teachers are demanding lower class sizes, more counselors, librarians and nurses in the schools, and a moratorium on new charter schools. · Before the strike even started, Reclaim Our Schools LA, the labor/community/student coalition that is supporting the teachers, held a series of trainings and spirited meetings to prepare for the strike. This powerful video conveys the energy and passion that was building in the days before the strike began. · On Monday, January 14th, every public school in the city – over 900 of them – joined the strike. Over 10,000 parents, students and community members have turned out in support of the teachers. · 50,000 people marched to LAUSD headquarters in the rain on Monday, demanding action. · Pickets continued on Tuesday, and teachers from The Accelerated Schools – a charter school network in Los Angeles, walked out in support of UTLA. · On Tuesday morning, a rally was held at the offices of the powerful California Charter Schools Association. · Members of Congress, including Representatives Alexandria Ocasio-Cortez, Ro Khanna, and Mark Pocan, and Senators Bernie Sanders, Elizabeth Warren and Kamala Harris tweeted their support. · On Wednesday afternoon, activists targeted LAUSD Board President Monica Garcia at her home, demanding she meet with them to discuss their concerns. Garcia called the police instead. You can see footage of the demonstration here. · Media coverage has been massive, all across the country. The Washington Post covered the strike in a front-page story here. 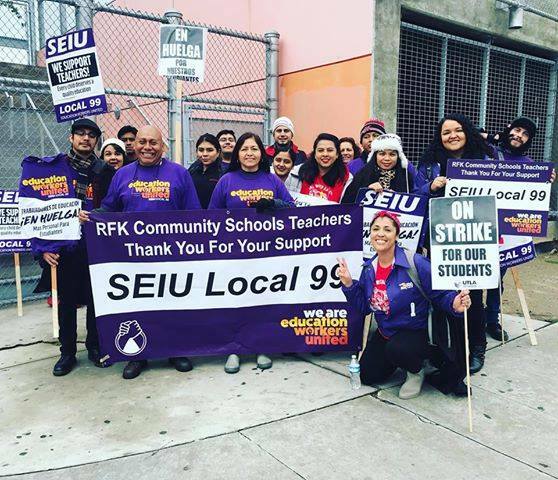 · By Thursday, members of SEIU Local 99 were leaving their jobs to support the teachers. Sympathy strikes—walk-outs by school support staff—were planned at a dozen LAUSD schools on Friday, and more are promised next week. Students joined the effort as well. Here’s a video of elementary school students singing to their striking teachers. Another video showed striking teachers singing back to their students (too blurry to link here). The California Teachers Association is circulating a petition in support of Los Angeles educators. The petition is available here. Join the Resistance! Be Part of the Action! You can support the strikers, parents and students in Los Angeles through a contribution to the AROS solidarity fund. Please join us. If you haven’t made a donation yet, now is the time! Investment in public education is becoming an issue in other cities as well. In Iowa, the state’s school districts are lobbying the state legislature to extend a sales tax to support school facilities renovation. In Boston, mayor Marty Walsh has backed a bill that would provide hundreds of millions of new dollars to public schools. Read more about that here. Next week on Capitol Hill in Washington, the Alliance to Reclaim Our Schools and the Journey for Justice Alliance are hosting a briefing for House staffers to discuss the findings of two reports, Confronting the Education Debt, by AROS, and Failing Brown v. Board, by J4J. The briefing is supported by Representatives Rosa DeLauro and Bobby Scott, each powerful champions of public schools. The New York State Board of Regents has passed a resolution defying the recent decision by Education Secretary Betsy DeVos to rescind discipline guidance passed by the Obama administration, that is intended to provide supports to students and school districts so that their discipline policies are not used in a racially discriminatory fashion. Read more about the action taken by the Board of Regents, as well as a full copy of the resolution here.